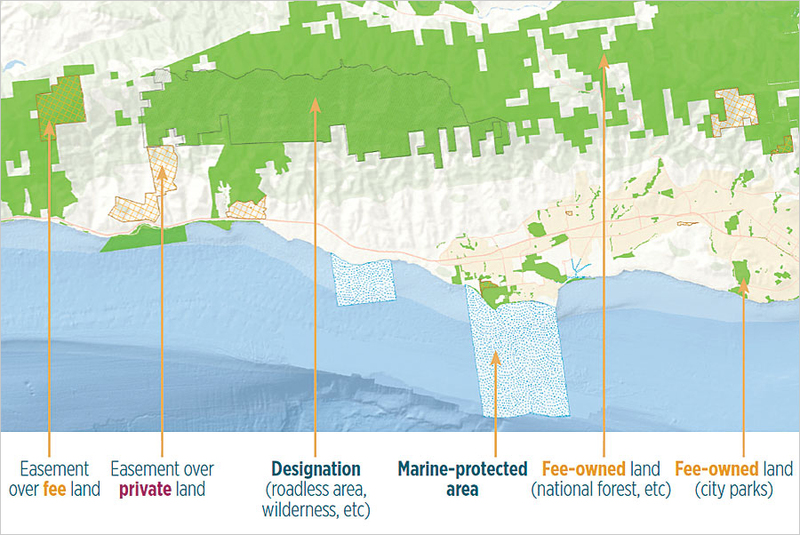 The Protected Areas Database of the United States (PAD-US) categorizes fee and private lands, designation areas, easements, and marine protected areas. By 2020, it will be feasible to find GIS data for any park or other protected area in the United States. In fact, it’s almost possible now. 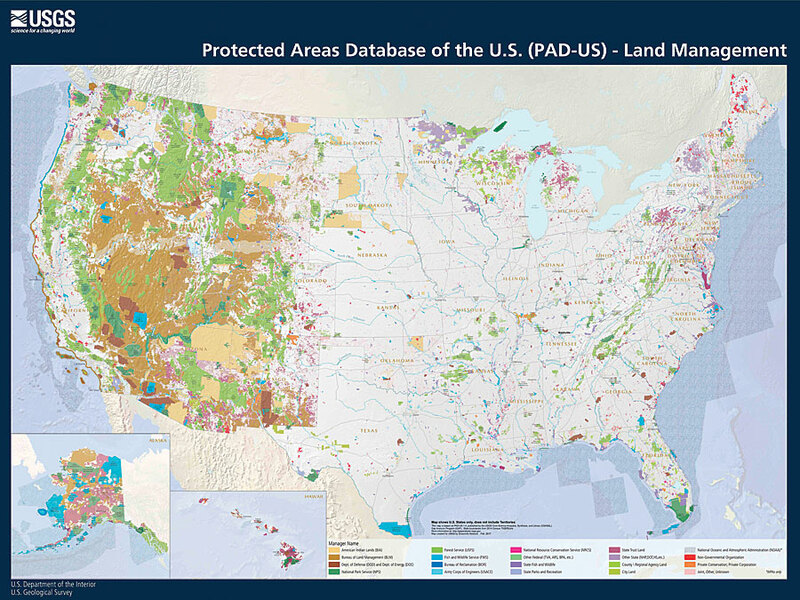 The Protected Areas Database of the United States (PAD-US) is the official GIS inventory of public parks and other protected areas in all US states and territories. It contains 3 billion land and marine acres managed by more than 15,000 agencies and nongovernmental organizations (NGOs) in over 150,000 separate parks and protected areas. Developed and managed by the US Geological Survey’s (USGS) Core Science Analytics, Synthesis, and Libraries, the most recent data—published as version 1.4 in May 2016—has close-to-complete data for federal and state agencies. PAD-US also has nonsensitive easement data from the National Conservation Easement Database and information on marine protected areas from the National Oceanic and Atmospheric Administration (NOAA). What’s left to finish are the regional and local levels, where detailed data is only available for about 15 states. A just-released action plan for USGS lays out what’s needed to complete PAD-US by 2020, and scheduled updates to the dataset for this year and 2018 are key steps along the way. For the first time, planners, conservationists, and many others can now look forward to having parks and protected areas all mapped out in the next three years. 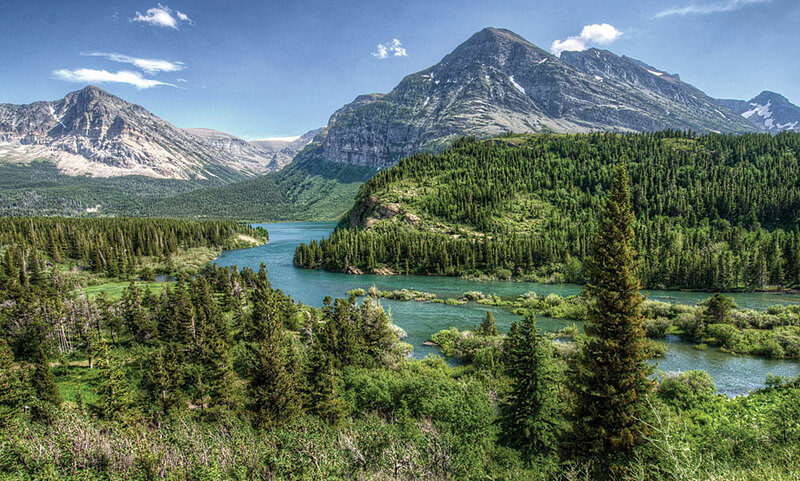 PAD-US contains 3 billion land and water acres managed by more than 15,000 agencies and NGOs in over 150,000 separate parks and protected areas in the United States and its territories. The data in PAD-US can be used to meet a wide range of needs. For example, app developers who are working on park finder apps, like Recreation.gov, or ParkRx apps, which allow doctors to prescribe park use to patients with chronic diseases, can use PAD-US to build their web apps. The National Wildfire Coordinating Group can use the database to effectively manage fire response. Communities and nonprofits can use it to define conservation priorities for habitats and species. And it provides a framework for tracking federal and state Land and Water Conservation Fund investments. 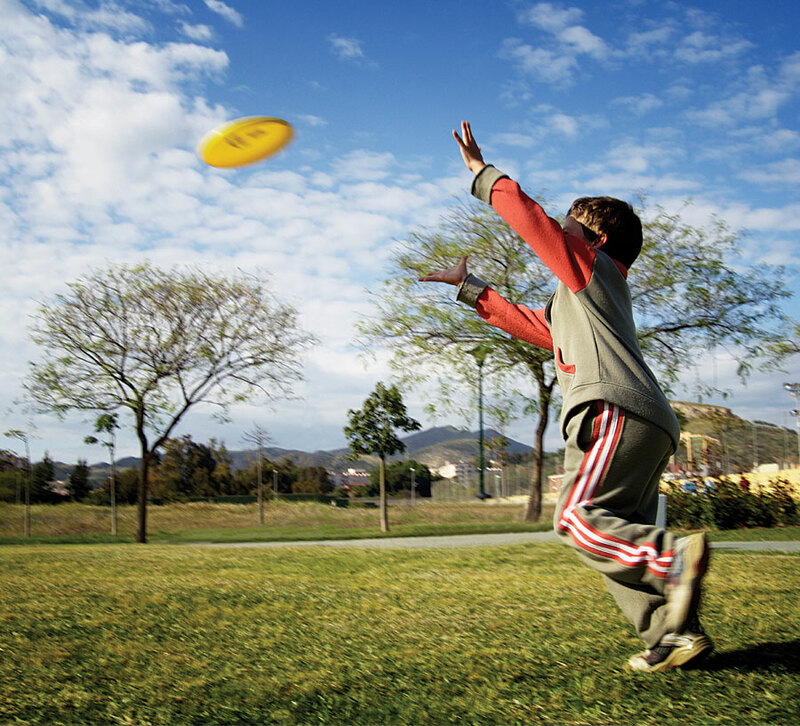 Regional and county planners can also use PAD-US to better assess park needs in their areas, and local and state governments can use the maps and data to calculate parks’ economic benefits when coming up with tourism-based economic development ideas and to better guide visitors to local parkland. Additionally, land planners can employ PAD-US to site the best locations for energy and transmission facilities. The PAD-US database is particularly useful to anyone who needs regional data as well, including counties; intrastate, multistate, and national organizations; research bodies; and planning and policy groups. 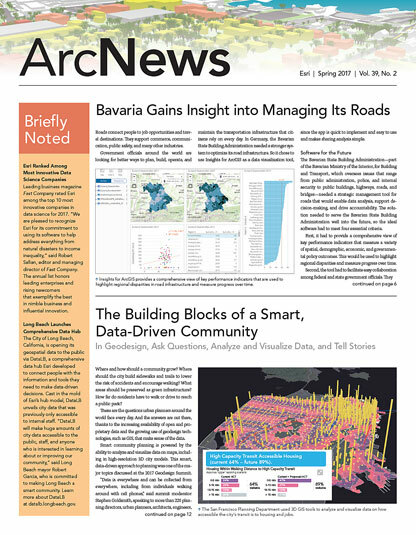 The data is also available as an ArcGIS web map, making it easy for Esri users to find it and apply it to their work. PAD-US is a complex dataset developed by integrating scores of data flows from land-owning and management agencies, as well as NGOs. PAD-US is a complex dataset developed by integrating scores of data flows from land-owning and management agencies, as well as NGOs. At its core, PAD-US defines the boundaries of public parks and protected areas owned and managed by governments and nonprofits, including terrestrial and marine areas. 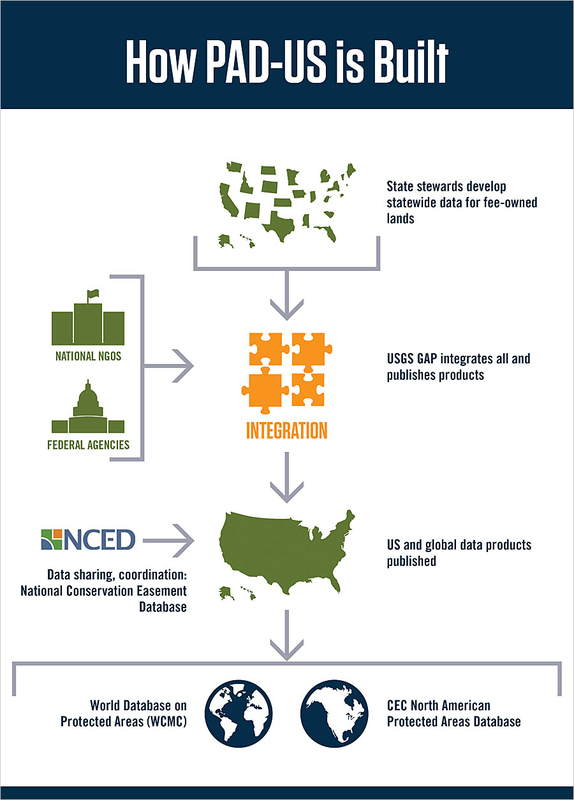 To get federal, state, and NGO data into PAD-US, USGS works with federal agencies and data stewards—such as state governments, universities, and nonprofits—to aggregate data for state and local parks and protected areas. With more than 30,000 state, regional, local, and NGO land managers, state aggregators create a distributed yet viable system for gathering the data. The PAD-US development team manages all the data in ArcGIS in a file geodatabase. Geodatabase domains help PAD-US data managers standardize attributes. Having multiple feature class representations supports data development and managing overlapping designations. PAD-US web mapping services, which provide users with ready-made interpretations of the data, are available through USGS and shared via ArcGIS Server 10.3 and later, including ArcGIS Enterprise. The USGS PAD-US Viewer and the web map are examples of how these map services can be used to aid interpretation, with the data broken up into Manager Type, Manager Name, Protection Status, and Public Access, for example. PAD-US is first and foremost a product of collaboration and coordination, particularly at the federal, state, and NGO levels. For the past five years, USGS has cochaired (along with the US Census Bureau and the Bureau of Ocean Energy Management) the Federal Lands Working Group (FLWG), an innovative partnership of 15 federal agencies that are defining data translation protocols for sharing all federal-level land management data directly into PAD-US. This has been a huge task. Tremendous progress was made for PAD-US 1.4, and momentum is building. Nongovernmental organizations also play key roles in PAD-US. The Nature Conservancy, for example, has helped develop inventories in many eastern states. The National Conservation Easement Database, which is led by the Trust for Public Land and Ducks Unlimited, secures easement data from land trusts and agencies. And the National Recreation and Parks Association promotes PAD-US-compatible data standards and tools for its thousands of agency members. Thanks to the considerable efforts of these data stewards and USGS, PAD-US version 2.0 will be released before the end of 2017. In addition to having extensive data updates for many state and federal lands, the second version of the geodatabase will have a new structure with separate feature classes for fee ownerships (e.g., national forest or state park), designation areas (such as wilderness, wild and scenic rivers, areas of critical environmental concern, and some state wildlife areas), easements, and marine protected areas. This structure will resolve a long-standing challenge with PAD-US in which fee-owned lands and designated areas have been in a single feature class with many overlaps, requiring extra data manipulation to conduct analysis. The new PAD-US structure will also help USGS publish tailored PAD-US data editions (for conservation, land planning, recreation, and more) out of the core dataset. Additionally, federal agencies are seeking to reduce the overlaps and slivers between agency datasets, which will boost the analytical capabilities of PAD-US. Later in 2018, the Trust for Public Land is scheduled to release its ParkServe GIS dataset, which will cover parks in all urban areas of the United States. This data will add tremendous coverage, bringing the full database much closer to realization. Work is also moving forward on many other technical improvements to PAD-US. These include resolving boundary gaps and overlaps, filling in data for some attributes, and improving the status ranks for biodiversity conservation. By 2020, it is likely that PAD-US will be a complete inventory of public lands in the United States, incorporating all known sites and descriptive information. This will make continued maintenance by USGS and its state steward data partners much easier. Use it. Try it out! If you haven’t used PAD-US before, download the dataset, view it in custom map apps, or access more than 23 PAD-US-specific web mapping services. Support it. PAD-US is a national resource. Support making it the best dataset it can be. Collaborate with local, state, federal, and NGO data stewards to help them integrate the highest-quality geospatial data. Adopt it. If you are a parks data steward at any level, consider adopting the PAD-US data standards into your local data format. Comment on it. Tell USGS about your experience with PAD-US. What works? What doesn’t work? What else would you like to see in the database (and can you help make that happen)? Get in touch with the PAD-US team. 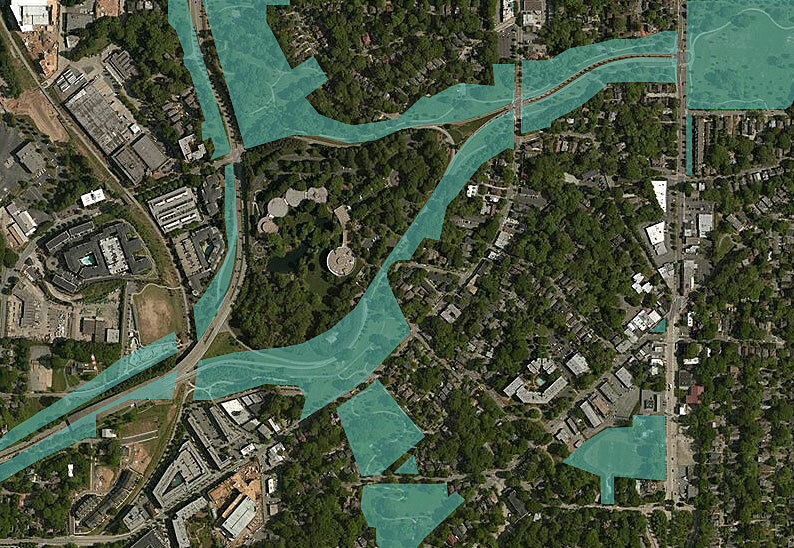 PAD-US contains detailed information about public parks and other protected areas in the United States, including this urban park in Atlanta, Georgia. PAD-US is already an incredible resource, and the vision of having a complete inventory of US parks and protected areas is within reach. Join the effort to help make it a reality. To find out more about the vision for PAD-US, download the full 2020 action plan report and an eight-page summary. This report was prepared for USGS by Boise State University in Idaho and the California-based nonprofit GreenInfo Network, with support from the National Park Service and the Centers for Disease Control and Prevention. Lisa Johnson is the PAD-US coordinator, and Mason Croft is the PAD-US technical specialist. They are both cooperators with USGS at Boise State University. Larry Orman is the founder of GreenInfo Network, a nonprofit that helps groups and agencies in California and across the United States with GIS.